Is Missouri’s disjunct population of Johnson’s tiger beetle extirpated? The December 2010 issue of the journal CICINDELA came out a little over a week ago. 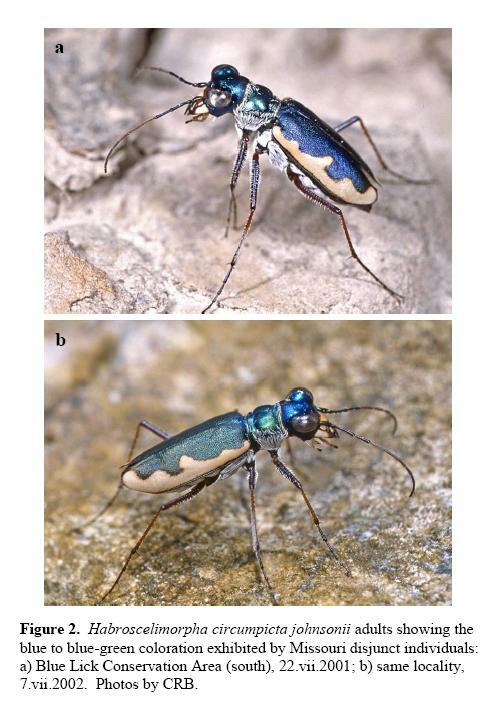 Leading off inside is the first in a series of papers that I, along with colleagues Chris Brown and Kent Fothergill, have prepared detailing our work with several species of tiger beetles in Missouri of potential conservation interest. At the start of our surveys, Missouri’s tiger beetle fauna was already fairly well characterized, at least qualitatively, due to the efforts of heavy hitters Ron Huber and Dave Brzoska, who for many years lived in nearby eastern Kansas. Despite their attentions, however, questions lingered regarding the precise distribution and status of several species of restricted geographical occurrence within the state, and our surveys over the past 10 years have sought to resolve these questions and, if necessary, recommend conservation efforts to secure the long-term survival of these species within the state. One of these species of interest is Habroscelimorpha circumpicta johnsonii (Johnson’s tiger beetle). This subspecies is widely distributed in inland areas of the central and south-central United States, where it is associated exclusively with barren areas surrounding saline seeps. Despite the broad occurrence of the main population, the Missouri population of this subspecies has long been of particular interest for several reasons: 1) its widely disjunct isolation, occurring several hundred miles east of the nearest populations in central Kansas, 2) its strict association with the highly restricted saline seeps of central Missouri (Fig. 1), and 3) the exclusive blue-green coloration of the adults (Fig. 2) that contrasts with the varying proportions of reddish and/or dark morphs, in addition to blue-green morphs, found in other populations. The highly disjunct and isolated occurrence of this population and its unique coloration have been considered by some workers as grounds for separate subspecific status. Another restricted, disjunct population of this species in North Dakota has already been accorded subspecific status – H. circumpicta pembina. Despite its restricted occurrence in Missouri, a long history of collection records exist for the subspecies. Numerous specimens are housed in the Enns Entomology Museum in Columbia, Missouri, with a majority of these coming from a single location (Boone’s Lick Historic Site) and dating back as early as 1954. In more recent years (1985-1992), Ron Huber and Dave Brzoska found significant numbers of beetles at two additional locations near Boone’s Lick. Despite these numerous records, the subspecies was listed as a “Species of Conservation Concern” by the Missouri Natural Heritage Program with a status of “S2S3” (vulnerable or imperiled) due to the rarity of its required saline seep habitats in Missouri. Unfortunately, this alone did not appear to be sufficient protection for the species, as my own observations beginning in the mid-1990s suggested that populations of the beetle had declined significantly from their historical levels. Concomitant with these apparent declines was the observation that the sites supporting these beetles had themselves suffered severe degradation that reduced their apparent suitability as habitat for the beetle. 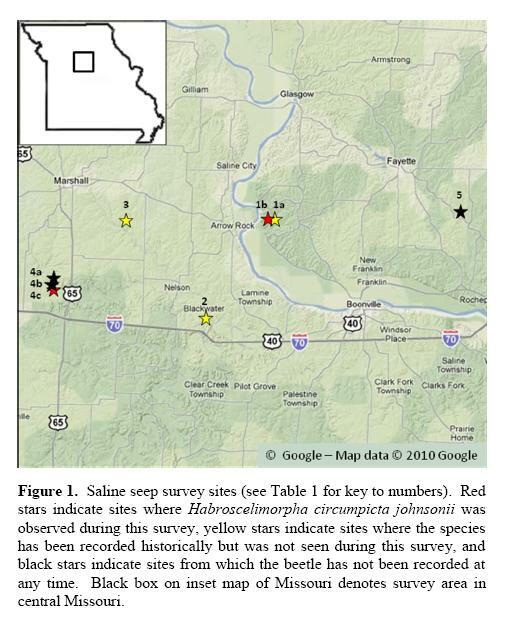 As a result of these observations, Chris and I initiated comprehensive surveys during the 2001 field season to assess the conservation status of the Missouri population and identify potential new sites. Our first order of business was to petition a status change to “S1” (critically imperiled), and for the next three years we regularly visited the historical sites throughout the presumed adult activity period, noting occurrence of adults and recording their numbers and the circumstances of their habitat associations. Included in these surveys also were two new sites identified using the Missouri Natural Heritage Database. The results were not good – during the 3-year survey, only a single beetle was observed at the historical location of Boone’s Lick, and none were observed at the two other locations discovered by Ron Huber and Dave Brzoska. More significantly, all three sites had suffered severe degradation due to vegetational encroachment, cattle trampling, or other anthropogenic disturbance. Moreover, of the two potential new sites identified, only one of these (Blue Lick Conservation Area) was found to support a small population of the beetle. Three apparently suitable saline seeps exist at this latter site; however, beetles were observed at only one of them. During the final year of the survey, prolonged flooding occurred at this site (frustratingly, a result of earth-moving operations by site personnel), which was followed in subsequent years by significant vegetational encroachment (Fig. 3). No beetles were observed at this site during the final year of the survey, nor has the species been seen there in multiple visits to the site in the years since. The loss of this beautiful and distinctive beetle from Missouri’s native fauna would represent a significant and tragic loss to this state’s natural heritage. We urge the Missouri Department of Conservation, the Missouri Department of Natural Resources, and other conservation organizations within the state to identify and allocate the resources needed to develop and implement a recovery plan for the species in Missouri. Brown, C. R. and T. C. MacRae. 2011. 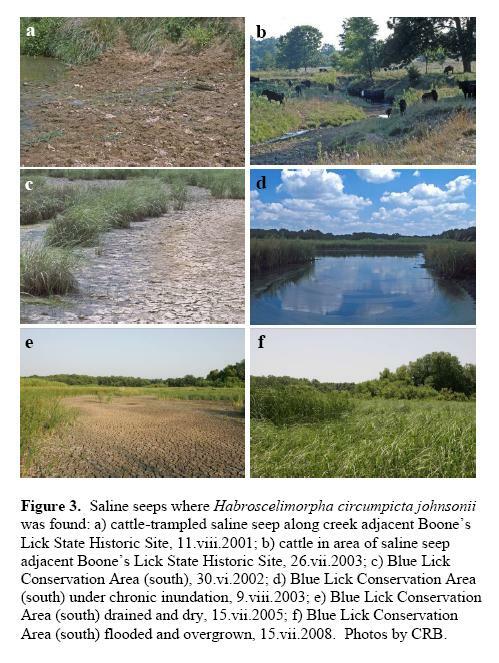 Assessment of the conservation status of Habroscelimorpha circumpicta johnsonii (Fitch) in Missouri CICINDELA 42(4) (2010):77-90. Postscript. On a happier note, I am pleased to be joining the editorial staff for CICINDELA. While my role as layout editor is more functional than academic, I am nevertheless thrilled with the chance to “rub shoulders” with the likes of Managing Editor Ron Huber and long-time cicindelid experts Robert Graves and Richard Freitag. I hope my contributions to the journal’s production on the computer end of things will be favorably received by its readership. This entry was posted in Cicindelidae, Coleoptera and tagged beetles, conservation, endangered species, entomology, insects, literature, Missouri, science, tiger beetles. Bookmark the permalink. 15 Responses to Is Missouri’s disjunct population of Johnson’s tiger beetle extirpated? The loss of any animal or plant specie is a loss for all humanity. In my years i have seen many bird and fish species disappear from my area for all kind of official reasons. As tiny as they were they left a huge empty spot in my life. Everything should be done to protect those beautiful insects from oblivion. This one really bothers me, as our surveys were initiated in order to prevent this from happening. Great post – it resonates with me as I work on chrysomelids and in Britain, Cryptocephalus exiguus is probably extinct due to the only remaining site (Pashford Poors Fen) drying out – the site was protected but surrounding land wasn’t, and hence was drained for farming etc which caused the fen to dry out as well = habitat loss. It’s widespread in the Palaearctic, but as in your example, it probably won’t come back unaided unless the habitat is right. Recovery efforts for this particular population are especially problematic because of its presumed genetic divergence – augmenting with individuals from the main population would destroy that divergence. As our paper shows, however, the population is now down below detectable limits, so even if we could find beetles it would be risky to remove them from the habitat to attempt captive breeding. I think the only chance this beetle has is for us to try to restore as much suitable habitat as possible at all of the sites where the beetle has been recorded in the past and hope that it shows up again. If it does, then captive breeding might be used to augment its recovery and establishment. If it doesn’t show up again, and if its genetic uniqueness is confirmed through molecular studies, then this becomes not a case of extirpation, but extinction! It is sad to see this happen. A site gets protected, but its hydrological or other natural processes don’t — leading to extinction. It’s so frustrating that many times the people charged with the responsibility of protecting these islands of habitat seem indifferent to the value of unique creatures like Johnson’s tiger beetle. I see from Dave’s comment that this is a world-wide problem. Your blog has helped me learn so much about biodiversity. I am especially frustrated in this case, as our early warnings about what was happening seemed to have gone largely unheeded. Even now, as I distribute this final paper to conservation stakeholders within the state the reaction is mostly mute. It’s almost as if everybody wants to stick their head in the sand and just pretend it didn’t happen. How sad, I don’t know what else to say. Johnson’s tiger beetle may not have the public profile of prairie chicken or Mead’s milkweed, but it is certainly a beautiful representative of an insect group that typically receives much more conservation attention than other insect groups. I have my own ideas about why a more vigilant effort wasn’t made when it became clear this beetle was in trouble – and they don’t involve lack of interest. I should probably stop there.